salutes his hero in Duck Dodgers in the 24 1/2th Century. 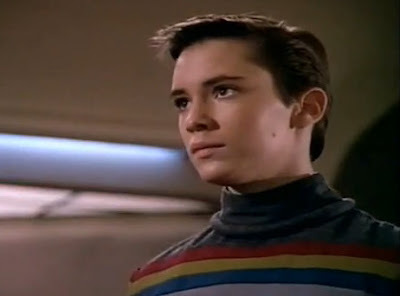 he attended Space Academy in the 24th century. of interstellar survival while Lost in Space from 1965 to 1968. 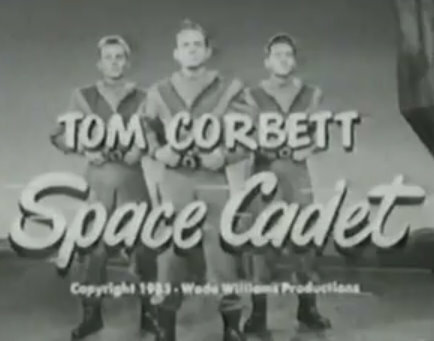 The first edition of Star Trek lacked a space cadet but not the second. everyone knew he was a real space cadet from the start. 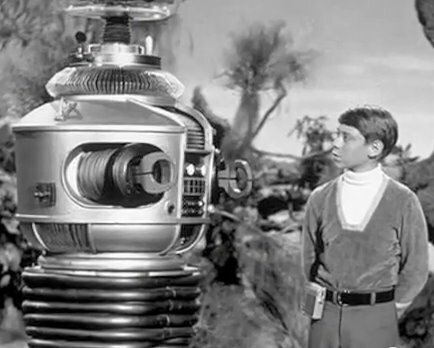 Before Duck Dodgers in the 241/2th Century (1953), the Chuck Jones unit at Warner Bros. produced two other forays into science fiction territory. 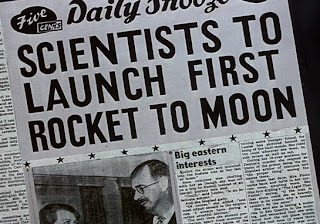 In 1948, they made Haredevil Hare where Bugs is launched on a rocket to the moon and, several years later, The Hasty Hare (1952) where Marvin the Martian visits earth on assignment to bring back an earthling (Bugs Bunny is his choice). 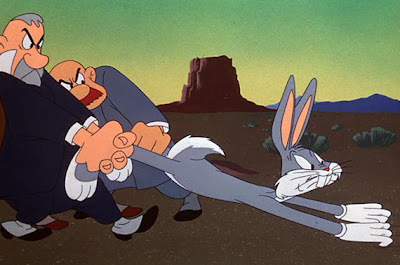 Director Chuck Jones and writer Michael Maltese rarely passed on an opportunity to parody a subject, but their Haredevil Hare (1948) isn’t the parody of science fiction movies that it initially appears to be. It can’t be because there were no science fiction movies to parody in 1948. 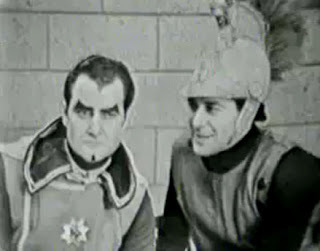 During the 1930s, there were several popular space opera serials but that period was followed by a parched drought of filmed science fiction during World War II and the immediate post-war years. Writers continued to produce science fiction but the mood was changing there, too. The new authors—Robert Heinlein, Isaac Asimov, and Arthur C. Clarke—experimented with a new “hard” science fiction approach that had little in common with the escapist adventures of Buck Rogers and Flash Gordon. Behind Bugs, the desert background in the opening of Hardevil Hare. Despite coming first by two years, Haredevil Hare now looks like a parody of Destination Moon (1950). 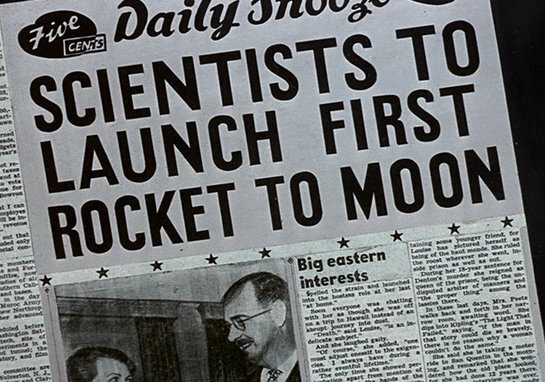 Co-written by hard science fiction writer Robert Heinlein, Destination Moon opened Hollywood’s floodgates, releasing a decade-long torrent of filmed science fiction. The Hasty Hare parodied one of the best of the new movies. Bringing back Marvin the Martian and his bounding alien pet K-9 from Haredevil Hare, the two aliens arrive on earth in a flying saucer, setting the stage for a round of jokes aimed at The Day the Earth Stood Still, Twentieth Century Fox’s big hit from fall 1951. With its good-natured parodies of Buck Rogers, Duck Dodgers in the 24 1/2th Century primarily reflected the old-fashioned space opera tradition but it also contained at least two references to contemporary science fiction films. First, the idea of Planet X may well have been inspired by Edgar G. Ulmer’s low-budget quickie The Man From Planet X (1951). 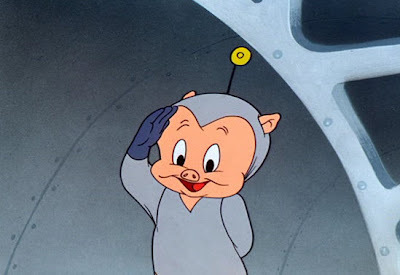 Second, Porky directly mentions another contemporary science fiction film hit when he hands Marvin some dynamite and calls him, “You thing from another world, you.” The Thing (from Another World) was a 1951 hit from acclaimed mainstream director Howard Hawks. Captain Video and His Video Rangers. But the most significant influence of all came from television. This is the influence that Jones himself acknowledged in his letter to his daughter Linda in October 1952: “It’s a parody on the ‘Space Cadet,’ ‘Captain Video,’ type television show…” Considering how few channels there were, the amount of science fiction on the air in those years was astonishing. Space Cadet and Captain Video are just the tip of the iceberg. From 1950 to 1953, there was also Buck Rogers, Commander Cody, Space Patrol, Tales of Tomorrow, Stranger From Space, Out There, Johnny Jupiter, Space Command, Atom Squad, and Rod Brown of the Rocket Rangers. Chuck Jones and crew had plenty of material ripe for parody when they promoted Daffy to space hero status.